Why program graphics processors (GPU)? Why use the GPU for non-graphical computations? Programming the GPU for better graphics. In 2001, NVIDIA was first to produce a commodity chip capable of programmable shading, the GeForce 3 (code named NV20). In 2002, the ATI Radeon 9700 (also known as R300) pixel and vertex shaders could implement looping and lengthy floating point math. Earlier cards provided "fixed function" capabilities -- predefined lighting and texturing methods with user specified parameters. Per-pixel lighting with an OpenGL fragment shader. Normal OpenGL lighting without shaders. Angle-dependent transparency with an OpenGL fragment shader. Normal OpenGL transparency without shaders. Above Chimera shader images made with the following OpenGL fragment shader. const int kl = 1;  // Chimera key light is 1, fill light is 0. Why do non-graphical computations on the GPU? Computer games do real-time physical simulations. Example: boulders rolling down hillside (image below). Many customers already own this high-performance parallel computer, i.e. their graphics card. 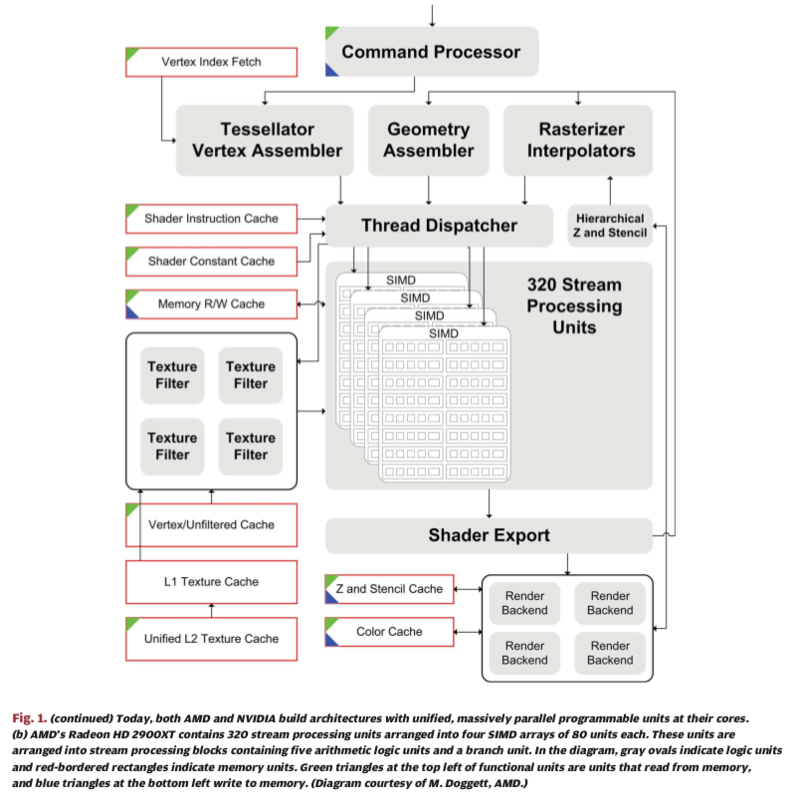 New GPUs (GeForce 8800, Radeon HD 4800 series) have hundreds of "unified shader" processing units. ~500-1000 GFLOPs theoretical peak performance. (Comparison: Intel Core 2 Quad 3.0 GHz processor 48 GFLOPS). 256 bit and larger bus widths (typically 64-bit for CPUs). For comparison, my older laptop graphics Radeon X1600 (Dec 2005) has 5 vertex and 12 fragment shaders, 10 GB/sec memory bandwidth, 128 bit bus width. Cost: GeForce 8800 GTX ~$500, Quadro FX 5600 ~$2500, Radeon HD 4870 ~$250. 3 The theoretical shader performance in single-precision floating point operations [FLOPSsp, GFLOPS] of the graphics card with shader count [n] and core frequency [f, GHz], is estimated by the following: FLOPSsp = 2 � f � n. For double-precision floating point operations supported on Radeon HD 3000 series products and onwards, the figure is estimated to be one-fifth (1/5) of the single-precision figure. 1 Vertex shader : Pixel shader : Texture mapping unit : Render Output unit. 16 subunits each with 8 stream processors. The 8 stream procesors execute a single instruction sequence (SIMD) on different data. Each 8 processors have their own data and instruction caches. Each stream processor can do a multiply and addition (2 operations) in a single clock cycle. 320 stream processing units arranged in 4 arrays of 80 units each. Each block of 80 is divided into 16 groups having 4 arithmetic logic units (ALUs) and one branching unit. Groups can operate on 4 component vectors (RGBA color, XYZW projective position, pqrs texture coordinates) simultaneously. More recent Radeon HD 4870 has 800 stream processors. GPU Computing: Graphics Processing Units -- powerful, programmable, and highly parallel -- are increasingly targeting general-purpose computing applications. Some explanations of stream processing, the GPU programming model, from Wikipedia. Given a set of data (a stream), a series of operations (kernel functions) are applied to each element in the stream. Uniform streaming, where one kernel function is applied to all elements in the stream, is typical. Stream processing allows parallel processing without explicitly managing allocation, synchronization, or communication among processing units. Compute Intensity, the number of arithmetic operations per global memory reference. In many signal processing applications today it is well over 50:1 and increasing with algorithmic complexity. Data Parallelism exists if the same function is applied to all records of an input stream and a number of records can be processed simultaneously without waiting for results from previous records. Temporal Data Locality is common in signal and media processing applications where data is produced once, read once or twice later in the application, and never read again. Some limitations mentioned in GPGPU Wikipedia article. Modest performance gains. While GPGPU can achieve a 100-250x speedup vs a single CPU, only embarrassingly parallel applications will see this kind of benefit. Quoted speed-ups in published applications tend to be 5x - 20x. Note: Chimera speed-up of Quadro FX 5600 (196 shader units) over Mobile Radeon X1600 (17 shader units) is just 2x. Slow or no double precision. Current top-end GPUs from Nvidia and AMD emphasize single-precision (32-bit) computation; double-precision (64-bit) computation executes much slower. Also 32-bit and 64-bit operations are sometimes (often?) not IEEE compliant. Limited branching and looping. In regular programs it is possible to control the flow of the program using if-then-else statements and various forms of loops. Such flow control structures have only recently been added to GPUs. Recent GPUs allow branching, but usually with a performance penalty. The branching is done by splitting a group of streams executing the same instructions into two groups according to which branch is taken by each stream processor. A dedicated "branching unit" manages the split. Difficult debugging. Can't print from the GPU program. Instead computed results as images. Graphics card and operating-specific code. Nvidia and AMD offer competing GPU programming languages that only work with their products. Most programming languages for stream processors start with C or C++ and add extensions which provide specific instructions to allow application developers to tag kernels and/or streams. CUDA (Compute Unified Device Architecture) Nvidia GPU programming language. Stream SDK AMD GPU programming languague (earlier sdk called CTM). OpenCL 1.0 (Dec 8, 2008 spec). Apple parallel computing language for GPUs. To be introduced in Mac OS 10.6. AMD (ATI) and Nvidia are adding full support (Dec 2008). Most shading languages for graphics GPU programs are similarly based on C.
Cg (Nvidia) [MGAK03], HLSL (Microsoft) [Mic05a], and the OpenGL Shading Language [KBR04] all abstract the capabilities of the underlying GPU and allow the programmer to write GPU programs in a more familiar C-like programming language. They do not stray far from their origins as languages designed to shade polygons. All retain graphics-specific constructs: vertices, fragments, textures, etc. Cg and HLSL provide abstractions that are very close to the hardware, with instruction sets that expand as the underlying hardware capabilities expand. The OpenGL Shading Language was designed looking a bit further out, with many language features (e.g. integers) that do not directly map to hardware available today. (Owens JD, 2008). www.gpgpu.org. "The goal of this page is to catalog the current and historical use of GPUs for general-purpose computation." First generation GPU core September 2006. Second generation GPU core April 2008. ATI X1600 - X1900 GPUs only. What about video cards with other (non-ATI) chipsets? The R580 (in the X1900XT, etc.) performs particularly well for molecular dynamics, due to its 48 pixel shaders. Currently, other cards (such as those from nVidia and other ATI cards) do not perform well enough for our calculations as they have fewer pixel shaders. Also, nVidia cards in general have some technical limitations beyond the number of pixel shaders that makes them perform poorly in our calculations. Is the GPU client for Windows XP only? Has it been tested on other OS's like Linux, Mac, and Vista? We will launch with Windows XP (32 bit only) support due to driver and compiler support issues. In time, we hope to support Linux as well. Macintosh OSX support is much further out, as the compilers and drivers we need are not supported in OSX, and thus we cannot port our code until that has been resolved. Users have reported the GPU client works in Vista, but due to a different DX version, the performance characteristics vary slightly from Windows XP. Most GPU articles are on medical imaging. I include only a few here. Most articles are published in IEEE Transactions on Visualization and Computer Graphics. Many GPU medical imaging applications from annual conference of the Medical Image Computing and Computer Assisted Intervention Society. Also many from a conference series Medicine Meets Virtual Reality. 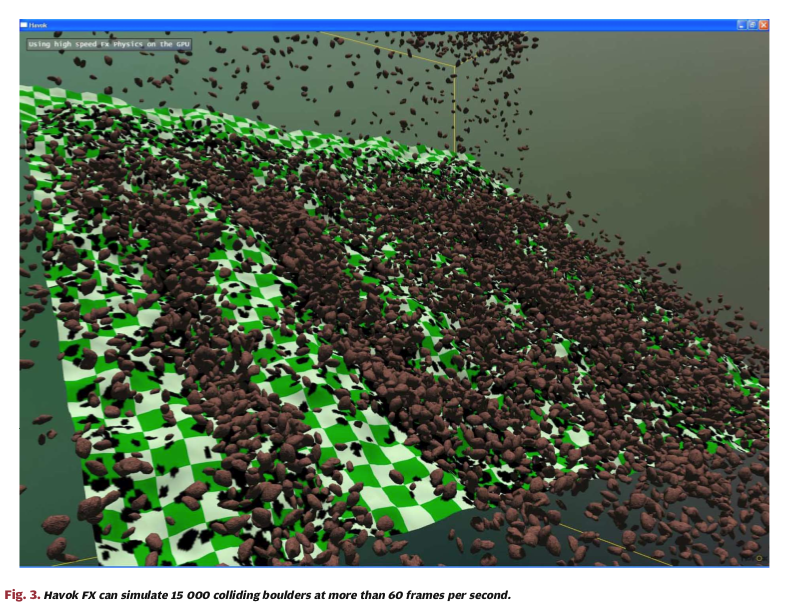 On modelling of anisotropic viscoelasticity for soft tissue simulation: Numerical solution and GPU execution. Taylor ZA, Comas O, Cheng M, Passenger J, Hawkes DJ, Atkinson D, Ourselin S.
Finite element modeling for biomechanical image registration and interactive surgical simulation. Automatic labeling of anatomical structures in MR FastView images using a statistical atlas. Fenchel M, Thesen S, Schilling A.
Med Image Comput Comput Assist Interv Int Conf Med Image Comput Comput Assist Interv. 2008;11(Pt 1):576-84. Deformable matching of medical imaging data to atlas of anatomical structures. MetaMol: high-quality visualization of molecular skin surface. Chavent M, Levy B, Maigret B.
J Mol Graph Model. 2008 Sep;27(2):209-16. Epub 2008 Apr 29. 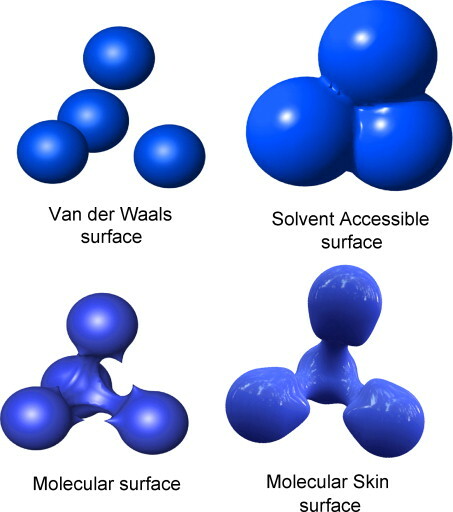 Raycasting computation of molecular skin surface, a smoother variant of Connolly surface, from analytic quartic surface. Eliminates two levels of sampling when rendering with a triangulation. Casta�o-D�ez D, Moser D, Schoenegger A, Pruggnaller S, Frangakis AS. J Struct Biol. 2008 Oct;164(1):153-60. Epub 2008 Jul 24. GPU implementations of common algorithms used for three-dimensional image processing: spatial transformations, real-space and Fourier operations, as well as pattern recognition procedures, reconstruction algorithms and classification procedures. 10-20x speed-up. A streaming narrow-band algorithm: interactive computation and visualization of level sets. Lefohn AE, Kniss JM, Hansen CD, Whitaker RT. IEEE Trans Vis Comput Graph. 2004 Jul-Aug;10(4):422-33. Level-set methods use partial differential equations to deform isosurfaces -- used of volume data segmentation. Requires fast interactive computation to hand-tune parameters. 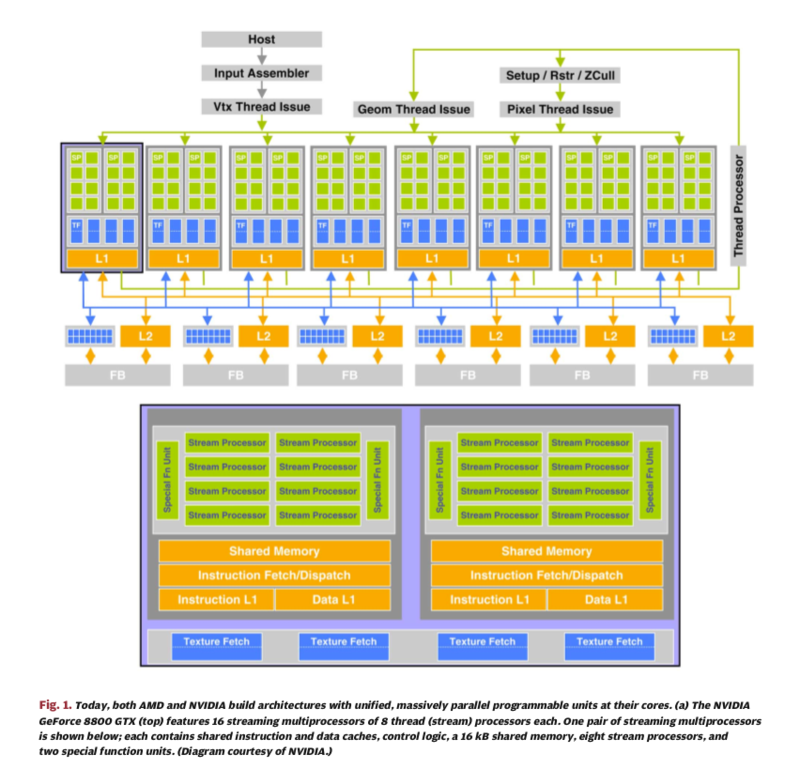 CUDA compatible GPU cards as efficient hardware accelerators for Smith-Waterman sequence alignment. BMC Bioinformatics. 2008 Mar 26;9 Suppl 2:S10. Smith-Waterman alignment takes time proportional to product of lengths of sequences -- much slower than BLAST and FASTA. Tried Smith-Waterman on a machine with two Geforce 8800 GTX cards. Equaled BLAST on length 500 sequences. Two-electron integral evaluation on the graphics processor unit. J Comput Chem. 2008 Feb;29(3):334-42. Evaluate the Coulomb potential in the ab initio density functional calculation. Evaluates limits of single precision floating point. 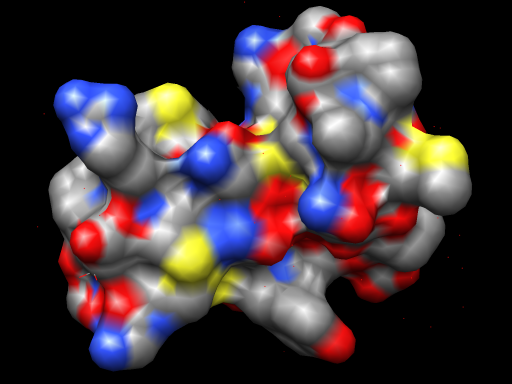 Uses Geforce 8800 GTX to find energies of Taxol and Valinomycin. High-throughput sequence alignment using Graphics Processing Units. Schatz MC, Trapnell C, Delcher AL, Varshney A.
BMC Bioinformatics. 2007 Dec 10;8:474. GPU implementation of MUMmer - a program for rapidly aligning entire genomes. Can find all 20-basepair or longer exact matches between a pair of 5-megabase genomes. Handle 1000s of contigs from a shotgun sequencing project. 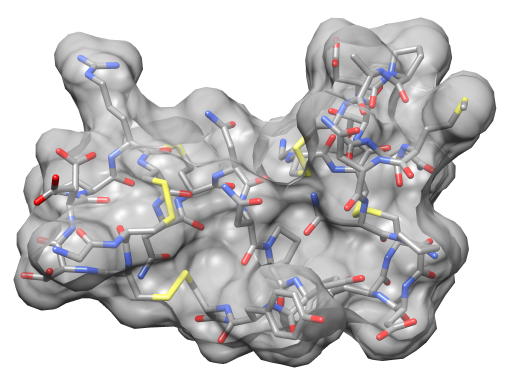 Accelerating molecular modeling applications with graphics processors. Stone JE, Phillips JC, Freddolino PL, Hardy DJ, Trabuco LG, Schulten K.
J Comput Chem. 2007 Dec;28(16):2618-40. Calculation of long-range electrostatics and nonbonded forces for molecular dynamics simulations. Coulomb-based ion placement and calculation of time-averaged potentials from molecular dynamics trajectories. Two-level approach to efficient visualization of protein dynamics. Daae Lampe O, Viola I, Reuter N, Hauser H.
IEEE Trans Vis Comput Graph. 2007 Nov-Dec;13(6):1616-23. GPU computation of atom positions based on rotation of residues. Multi-level graph layout on the GPU. IEEE Trans Vis Comput Graph. 2007 Nov-Dec;13(6):1310-9. Phys Med Biol. 2007 Jun 21;52(12):3405-19. Epub 2007 May 17. Back-projection calculation for medical imaging. Same technique as single-particle EM. Xie K, Yang J, Zhu YM. Comput Methods Programs Biomed. 2007 Oct;88(1):1-7. Epub 2007 Aug 13. "Collision detection is the key technology in nose augmentation surgery simulation system, which can avoid incorrect intersection between bones and the implant model." GPU-friendly marching cubes for visualizing translucent isosurfaces. Xie Y, Heng PA, Wang G, Wong TT. Stud Health Technol Inform. 2007;125:500-2. Computes and draws isosurface directly on the graphics card. Allows multiple transparent surfaces. No depth sorting needed since contours are found layer by layer back to front. Casta�o D�ez D, Mueller H, Frangakis AS. Electron tomography and single-particle EM recontruction on the GPU. Tries 3 algortithms, compared speeds to CPU. Failure of a traffic control "fatality" sign to affect pedestrians' and motorists' behavior. Harrell WA, David-Evans M, Gartrell J.
Psychol Rep. 2004 Dec;95(3 Pt 1):757-60. Word "gpu" is in authors email address. John D. Owens, David Luebke, Naga Govindaraju, Mark Harris, Jens Kr�ger, Aaron E. Lefohn, and Tim Purcell. Computer Graphics Forum, volume 26, number 1, 2007, pp. 80-113. 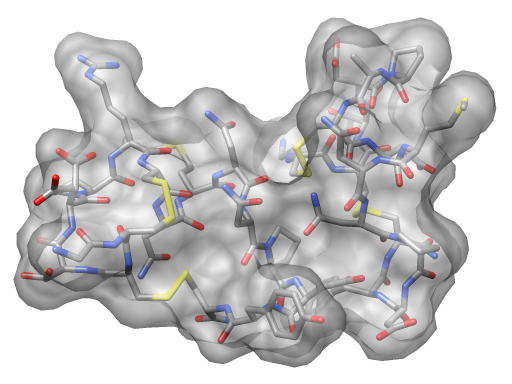 Speeding Up Molecular Docking Calculations Using Consumer Graphics Hardware. (Efficient Ant Colony Optimization Algorithms for Structure- and Ligand-Based Drug Design. Oliver Korb PhD thesis, University of Konstanz, 2008) Posted: 18 Nov 2008. CUDA compatible GPU cards as efficient hardware accelerators for Smith-Waterman sequence alignment. (Svetlin A. Manavski, Giorgio Valle, CUDA compatible GPU cards as efficient hardware accelerators for Smith-Waterman sequence alignment, BMC Bioinformatics 2008, 9(Suppl 2):S10 (26 March 2008)). Quantum Chemistry on GPUs. (Quantum Chemistry on Graphical Processing Units. 1. Strategies for Two-Electron Integral Evaluation, Ivan S. Ufimtsev and Todd J. Mart�nez, J. Chem. Theory Comput., 4 (2), 222 -231, 2008. doi:10.1021/ct700268q). Posted: 01 Apr 2008. What are the practical limitations of using GPU computation in production software, as opposed to use in research prototypes? I didn't read anything that directly talked about this. User may not have the required GPU. Need CPU implementation fallback. Operating system limitations: tools/drivers only for Windows XP 32-bit. GPU coding will take substantially more software development effort than an equivalent CPU implementation. Perhaps 5x - 10x more development time to code and maintain GPU implementation. Are there computations (in Chimera) where a 10x speed-up justifies the additional development effort? GPU computation is feasible in some production applications such as computer games and video processing. For scientific applications, I think only highly compute bound applications which take days, weeks or months of CPU time are good candidates for GPGPU. GPU computation for graphics (shaders) are ready for production use now in any OpenGL applications.